PVC pipe is widely used in drainage system,irrigation,electric conduit and so on. 1. Screw and barrel could meet the request of your formula with higher proportion of Calcium carbonate.Higher proportion of calcium carbonate means lower cost but the screw and barrel must be higher quality. 2. Our machine adopts ABB inverter,Omron/Delixi temperature controller,Schneider contactor and Simens switcher.High quality electrical component could meet the request of durable running at higher temperature in the place such as Southeast Asia and Africa. Our die-head designing gives ideal viscosity to melt material for pipe producing. 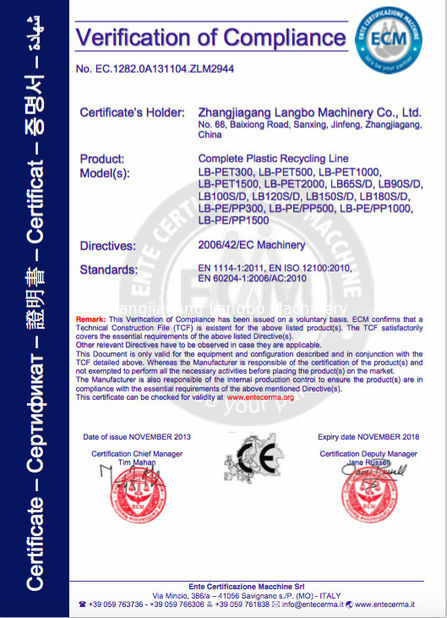 It gives tube or shape to plastic after processing. All faces the plastic in contact with is polish, so that frication losses minimized. 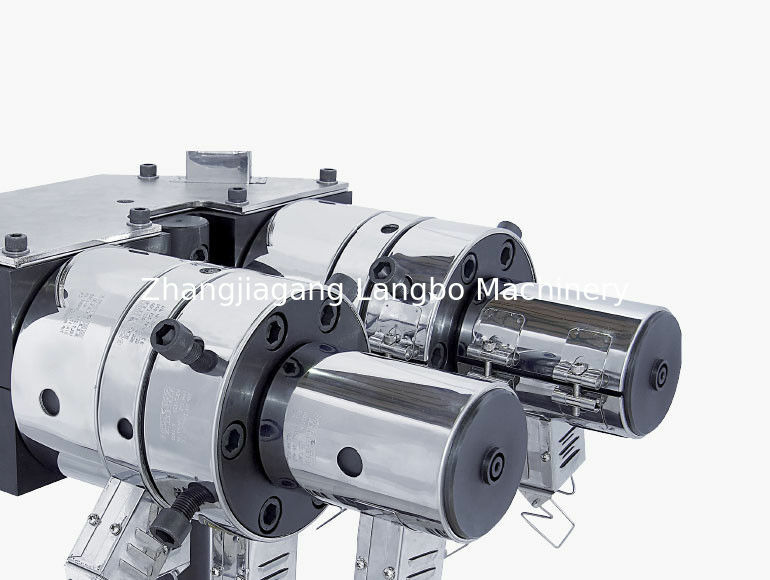 LANGBO produce single layer, two layer and multi layer pipe die-heads. Foil cover head. Over steel pipe plastic covering die-head and other special die-head. LANGBO Vacuum Tanks are manufactured with stainless steel. Our nozzles designing for maximum cooling performance. Cooled water sprinkles to hot plastic pipe outside face from the nozzles. 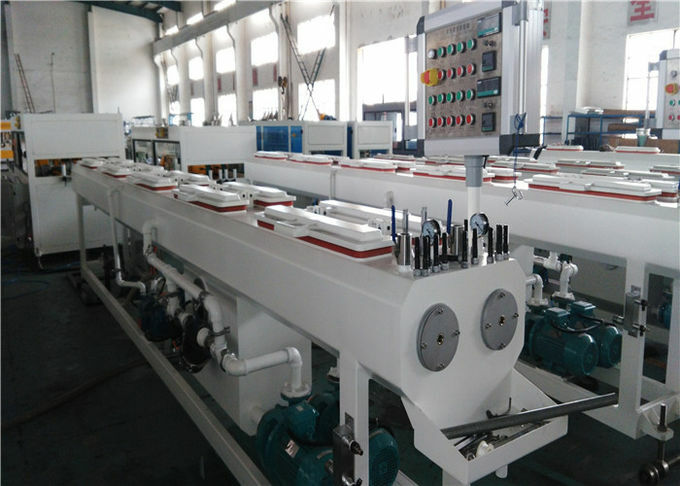 With high power water pump, cooled water can reach to pipe completely. 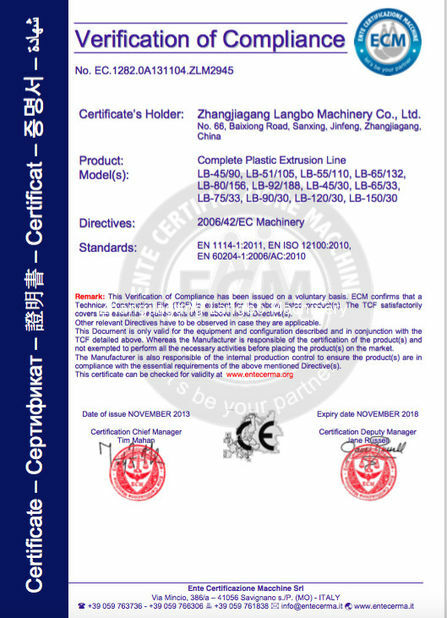 Our vacuum tank’s pressure can be adjusted, so vacuum pressure can be fixed according to pipe requirement. We sealing gasket for every lid on the vacuum tank. This stops vacuum leakage and minimizing energy consumption. With the material we have used in our haul-offs, we have very good adhesion to the pipe and ensure slip prevented. The needed speed for setting of pallets can be changed with electrical inverter. Different line speeds are adjusted by using control panel easily. We manufacture haul-offs depending on pipe diameter from 2 pallets to 10 pallets. Our haul-offs can work synchronously with pipeline. As the extruder speed increasing automatically, haul-offs speed is increased. LANGBO planetary saw cuts the pipe at designed length without any burr. Cutting speed during the cutting is synchronous with the line speed by PLC, so accurate length is provided. Pipe length to be cut is easily adjusted via the touch screen. Pipe length measure by encode so desired length can cut precisely. It operates on pneumatic cylinder.